A Star is Born is a story that seems to be revived every couple decades. The first film was in 1937. A remake with Judy Garland and James Mason came in 1954. And another came to be with Barbara Streisand in 1976. Now, with Lady Gaga, Bradley Cooper stars and has made his directorial debut with his new, updated version of the story. Here, instead of discovering a young actress, his aging star of a character discovers a young singer/songwriter. Bringing this story into the modern music industry breathes new life into it and uses the opportunity to bring amazing original songs into the film. The music is so central to the film it is nearly a musical. The soundtrack to this film is phenomenal. Each song is not only beautifully performed within the film but adds to the story. It’s hard for me to pick a favorite. Shallow, nominated for best song, is a perfect duet that helps establish our characters and their budding love story. Is That Alright is a sweet emotional declaration of love and Lady Gaga kills it. I’ll Never Love Again is a moving ending tribute that secretly reveals Jack’s intentions. And sometimes I just can’t stop listening to Always Remember Us This Way. I’m looking forward to seeing Cooper and Gaga perform on Oscar night. Cooper and Gaga are awesome together, I imagine there will be talk of Oscar nominations, but we’ll see how thick the competition grows. Cooper portrays his fading rock star with so much charisma that the audience can’t help but fall for him as Gaga’s Ally does. He stumbles drunk and gravels his voice so convincingly that he could be Sam Elliott’s brother. And Gaga steals the show growing from a meek young woman singing in a drag bar to a superstar as bright on screen as Gaga is in real life. She seems so perfectly cast for this role, she makes it all look so natural. Her greatest moment for me was first singing Shallow on stage, she looks so perfectly determined, nervous and overwhelmed to shine in such a big and unexpected moment. My biggest gripe with A Star is Born is that there seems to be no sense of time. We can assume this story takes place over years, but it feels like such a whirlwind that it could all be in a few weeks. Yes, I know it takes time to record albums and get to the Grammy’s and get in and out of rehab but it all it just thrown at us with nothing in the background to help us stay grounded in time. But perhaps that’s how this love story is, a whirlwind with time not factoring in. But I doubt that’s how Cooper meant it. Also, he is not very subtle with foreshadowing is he? If you’ve seen any previous versions of A Star is Born, you know what happens, but if you don’t, just look for a few clues. There’s some bright, neon ones hanging in the background for a little too long in the beginning. But let’s give the guy a break, for his first time directing he does a great job. A Star is Born has been nominated for eight Academy Awards including best original song, sound mixing, adapted screenplay, cinematography and Best Picture. While Bradley Cooper was shut out of a directing nomination, he did receive one for best actor, his fourth acting nomination. Sam Elliott is nominated for best supporting actor and Lady Gaga for best actress, both of them their first Oscar nominations. Among the eight Best Picture nominees announced yesterday, A Star is Born feels a bit out of place. I agree that it’s a very well done film, but it just seems to be lacking that certain something to send it over the edge. Many of the other nominated films are about race, politics or boast multiple female leads. Bohemian Rhapsody already has the musical aspect covered. And yet, here stands A Star is Born, a remake or a remake featuring white leads in heterosexual roles and a lot of lens flare. Maybe the Academy was afraid to lose their main viewers. Or Cooper knew what he was singing about. I cannot in good conscience call Chris Kyle anything but an American hero. He dutifully served his county, made it back to be with his family and his death was a tragic shame. I feel genuine sorrow for his family and can only wish them the best. I genuinely hope that American Sniper is something they can be proud of. In Clint Eastwood’s film depicting Chris Kyle’s life, both in and out of the military, we see a man who struggles to juggle so many roles. At first, Kyle (Bradley Cooper) is a cowboy with a cheating girlfriend. Then he joins the navy SEALS, making it through basic training with recruits much younger than himself. At the height of Kyle’s military career, he is known as the Legend, due to his fatally accurate sniping skills. At home, he is a husband and a father. Trying to fill all these roles, all these levels of masculinity, is exhausting, especially when the war is so hard to leave behind. The bulk of the film takes place during Kyle’s four tours in Iraq. As the man behind the gun, Kyle does not seem to take pride in the fact that he has so many kills, but that he has saved so many of his men. Rather than lay on a rooftop waiting, at times he volunteers to help on the ground. And as the film progresses, to give Kyle a more tangible enemy, there is an Iraqi sniper that he must take out, before he takes any more of his friends. The heart of the film is at home. Home is where Kyle becomes emotionally distant with his wife, where he visits injured friends and where he attends their funerals. One of the greatest scenes, in my opinion, was where Kyle is sitting in a bar alone. At first, it seems like a perfectly normal thing for a guy to do, just grab a beer and relax. Then his wife calls and asks when he is coming back to the states. He tells her he is stateside, his voice breaking and tears welling in his eyes. He might be just down the street. But the fact that he would rather sit alone in a bar than get back to his family as quick as possible breaks my heart. Maybe he needs some time to think, reflect, get himself ready to see his wife and kids again, or maybe it is too much to bear. Whatever the reason, that moment is what resonated with me the most. Cooper’s Oscar nominated performance and transformation into Kyle is astounding. 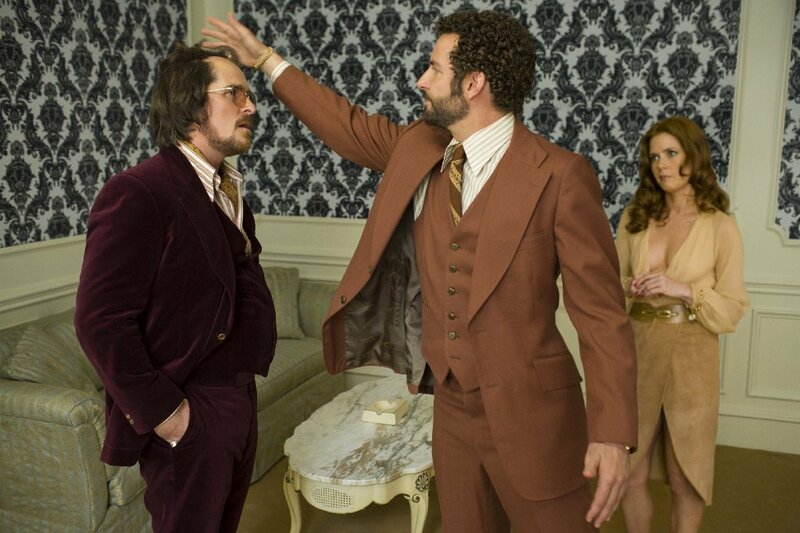 His physique from last year in American Hustle into this role is a dramatic change. Here, Cooper has gained a great deal of weight, muscle, a beard and a voice that makes him sound like a Texan good ol’ boy. In Silver Linings Playbook or American Hustle, I am never unaware of Mr. Cooper under that trashbag or perm, but here his image is nearly lost in this incredible transformation into Kyle. This makes three acting nominations, three years in a row for Bradley Cooper. Well done, sir! 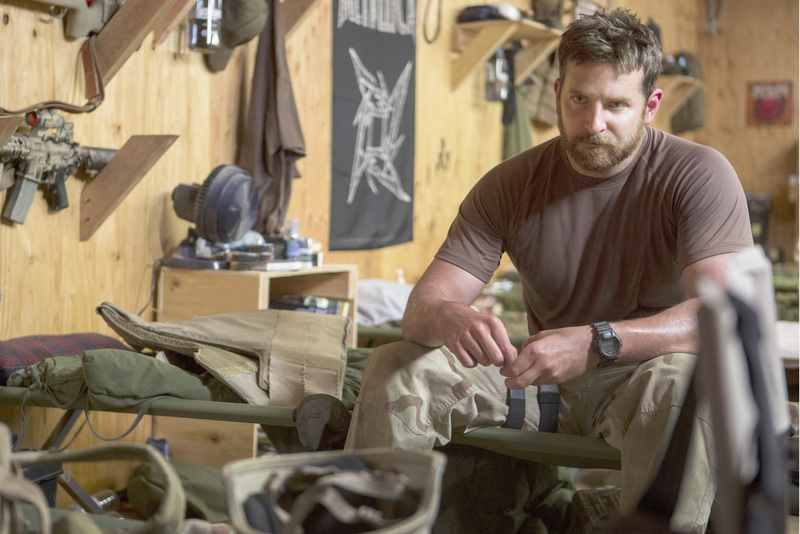 American Sniper is nominated for six Academy awards, including Cooper’s latest lead actor nomination. The others include best adapted screenplay, film editing, sound mixing, sound editing and best picture. I’m sure Clint Eastwood was considered by much of the Academy for best director, but this year other directors simply shined brighter. 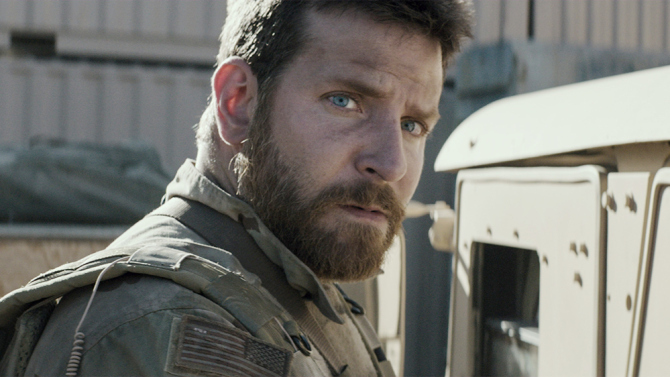 That being said, I don’t think American Sniper is far from my favorite film this year. At times, this film feels like a modern-day Sergeant York. There are so many firefights, by the time we get to the climactic point in Kyle’s military career, I was bored of all the gunfire. Worst of all, this film seems way too unsympathetic toward the Iraqi people and it does not feel like Kyle and the other soldiers are really helping the peaceful civilians there, but making their lives much worse. 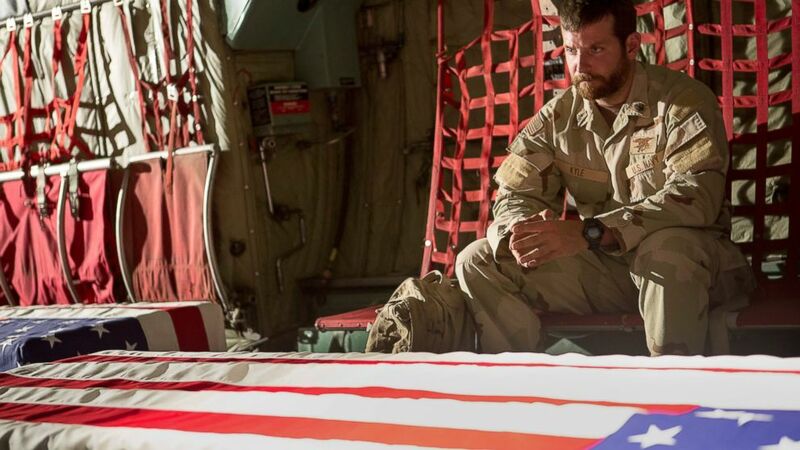 American Sniper has already broken box office records and millions more will see it. The film honors a great soldier and Cooper’s performance is worth the watch. However, it is a tough film to stomach, due to a lot of gritty, realistic war violence and profanity. Watch responsibly and leave the kids at home. David O. Russell’s American Hustle is a con plot, wrapped in a couple love triangles and then further complicated by the mob. Honestly, the whole point A to point B can get a little confusing, but the film easily keeps a captive audience on board every moment due to fantastic performances by great actors who breathe amazing life and quirk into their characters. First off, we have Irving (Christian Bale). He’s the epicenter, the main con man, experienced and damn good at what he does. After years of running multiple scams on his own, he meets Sydney (Amy Adams). She is up for the adventure and thrill of a good con and brings her own touch to a new phony lone business. She and Irving begin a passionate relationship, even though he is already married. His wife, Rosalyn (Jennifer Lawrence) is an unpredictable woman with a young son who spends her time tanning, painting her nails and doing other frivolous things. She knows Irving is having an affair, the two women just haven’t met, yet. 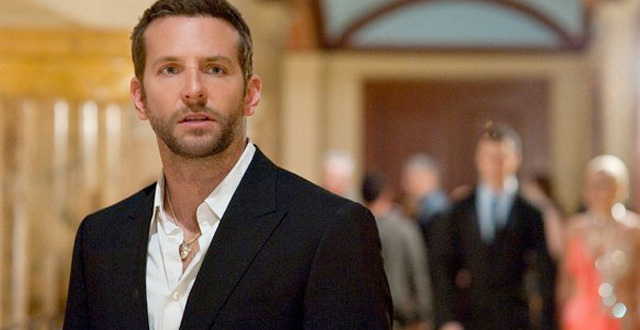 When Irving and Sydney’s bogus loans are busted by an FBI agent, Richie (Bradley Cooper), he makes a deal to release them if they help him arrest a few politicians. Richie wants to entrap the mayor of Camden, New Jersey, Politio (Jeremy Renner). Irving brings in a friend to pose as a Sheikh looking for potential investments in America, specifically with Polito. But Richie’s over-eagerness nearly screws up the whole deal. Thankfully, he has Irving and Sydney to help him out, but little does Richie realize that they are playing him, while Sydney is seducing him. As Politio is making friends with a phony Sheikh and going out to dinner with Irving and his wife, Irving starts to have second thoughts about the whole operation. It becomes a moral dilemma for him, seeing that Politio really is a nice family man just trying to make his city better. And when Irving finds himself getting involved in the mob, and his wife starts talking too much, things might get out of control. There is so much to enjoy about this film even if a con plot doesn’t sound like your cup of tea. Each actor brings charm and has their own great moments, including Louis C.K. in a great minor role as Richie’s boss. Though they may not be truly good guys, each character is so charismatic that you can’t help but love them, even be on their side to some extent. If you’re a fan of late 70s fashion, the wardrobes and hairstyles will delight. It’s rather hilarious to see Amy Adams dancing at a disco, Bradley Cooper in curlers and Christian Bale meticulously perfect his strange comb-over. 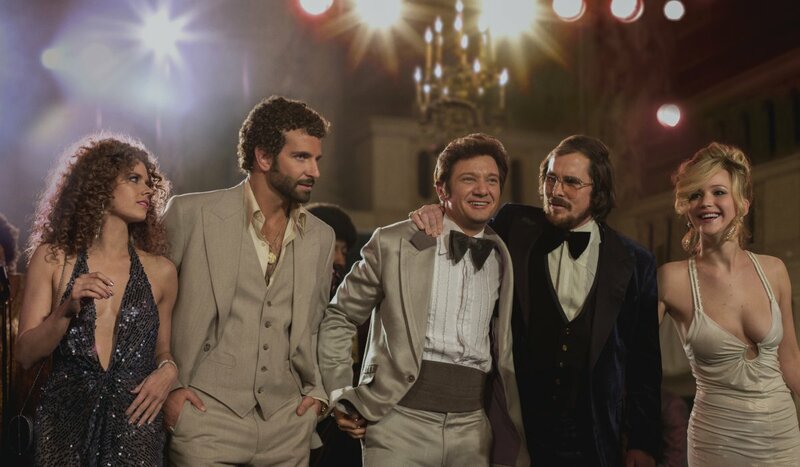 American Hustle is tied with Gravity for receiving the most Oscar nominations this year, a total of ten. Among them are Best Picture, costume design, film editing, production design and original screenplay. David O. Russell received his second consecutive nomination for best director. And among the actors, Christian Bale for lead actor, Amy Adams for lead actress, Bradley Cooper for supporting actor and Jennifer Lawrence for supporting actress. It is not often a film lands nominations in each acting category, but this film sure deserves it. My personal favorite scene really has nothing to do with the whole plot, but is just a hilarious moment with Irving’s ditzy wife using an early microwave, or as they call it, the science oven. We see her in the kitchen, talking to herself in a mocking voice about how she was warned not to put any metal in the science oven. Psh, what’s the harm right? Then she tosses in something in aluminum foil, and boom, you know what happens. But her breezy, whatever attitude suddenly replaced by instructing her son to get the other fire extinguisher is so flawless and hilarious, I can’t let it go. If Jennifer Lawrence wins her second Oscar for American Hustle, it will be because she blew up the science oven. Have I ever told you how much I love it when a great, heartfelt comedy makes it into the Best Picture nominations? Of the year’s nine nominations, Silver Linings Playbook is the most lighthearted film and it leaves you smiling and warm inside. Best of all, it feels like it did so effortlessly. Over the past 20 years, I can count the comedies nominated for best picture that made me feel this good on one hand: As Good As It Gets, Little Miss Sunshine and Juno. I love adding another rare treat to that list. Bradley Cooper plays Pat, a man trying to reinvent himself after being diagnosed and institutionalized with bipolar disorder. This time away has separated him from his wife. The details connecting the status of his marriage and his time the mental institute are revealed perfectly, so I won’t spoil the ride. His institutionalization seems to have been well for him, he has gotten in shape and is enthusiastic about the positive attitude he is trying to maintain. It is awkwardly endearing how he is so eager to tell everyone his excelsior motto and how he is practicing to be a better husband. You know that nearly everyone sees him as a huge loser. While Pat’s family sees that he is doing better, there is still room for improvement. He refuses to take his medications, claiming to not like how he feels on them, and it’s not easy for an aging couple to force their grown son to do anything. His social skills are lacking, sometimes Pat seems to blurt things out with no filter. His late night rantings, from being upset over the ending of a A Farewell to Arms, to feeling the urgent need to watch his wedding video, become a disturbance heard all down the street. Through a friend, Pat meets Tiffany (Jennifer Lawrence), whose husband recently died. While Pat’s poor social skills stem from his mental issues, Tiffany’s may come from a mixture of grief and just not having much to care about anymore. Her instigative scenes with Pat are beautifully raw while still keeping everyone at a distance. Lawrence has a sweet way of making Tiffany rudely real, vulnerable yet strong and one of the most level headed characters in the film. She and Pat strike up a friendship and a deal: Tiffany will deliver letters to Pat’s wife if he will enter a dance competition with her. I didn’t expect this to be a dance movie, and it isn’t, but watching Cooper and Lawrence move together is wonderful. As they practice, we are watching an unspoken bond form. It becomes a big release for them both, better than their therapy sessions. Romantics will hope for love to bloom, and us realists will just be happy that Pat is sleeping well at night and not bringing up his wife as much. Pat’s family is loving and supportive, but beautifully flawed. His father, Pat Sr. (Robert de Niro), seems obsessive compulsive about his rituals when watching sports. However, they come from good intentions; he just wants to spend time with his son, and seems to think of Pat as a good luck charm for the Philadelphia Eagles. He also has a short violent history that has him permanently banned from the Eagles’ stadium. 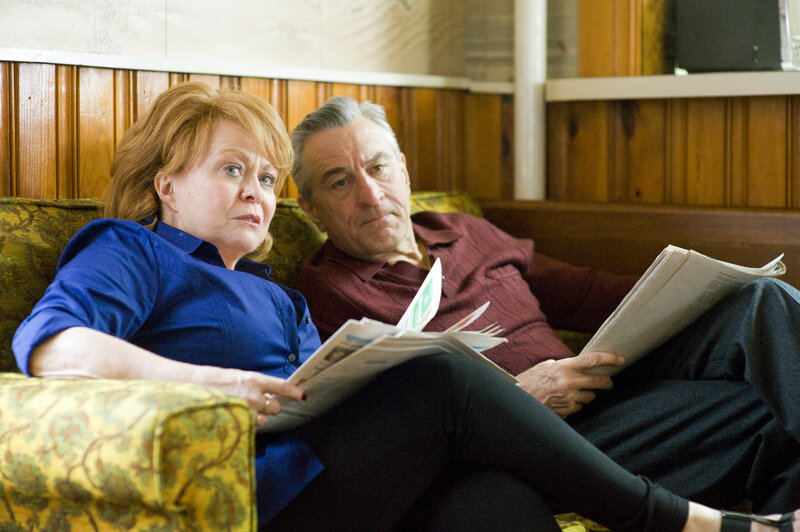 Pat’s mother, Dolores (Jacki Weaver), is a sweet and supportive aging woman who seems to have spent most of her life dealing with the different bits of crazy coming from her husband and son. She is weathered from it, but also stronger, smarter and more understanding. What I couldn’t understand was how she lets her husband place such steep bets on football games and how he personally involves Pat in them. But what do I know, I’m just an outsider looking in. Silver Linings Playbook is nominated for eight Academy Awards, and they are all the big ones too. Cooper, Lawrence, De Niro and Weaver are all nominated for their performances, earning the film a nomination in each acting category. The film has also earned recognition in best picture, editing, adapted screenplay and David O. Russell is competing for best director. That’s a lot of deserved recognition from a sweet modern dramatic comedy. I loved Silver Linings Playbook for all that it was and wanted nothing more from it. There was a good dose of human comedy, some drama without harsh tears and a way to find happiness in this strange world. While Pat’s mental illness is the stem of his problems, the film doesn’t preach, objectify or or let it define his character. It is just part of this human experience. The big dance scene is a wonderful climax that I wouldn’t dare ruin for you, but it made me think back to Little Miss Sunshine in the best way possible. This is an unexpectedly honest and sweet film that, like its characters, doesn’t apologize for being a little off beat.